Producing the world’s finest, most luxurious and sought after cigars for five generations, Davidoff cigars have been the cigar for special occasions like weddings, business deals, and graduations for many years. Many in the cigar industry would agree that Davidoff cigars have set the standard for excellence in production and manufacturing due to their well-defined standard of quality and excellence that have been passed down through the generations. Davidoff is well known for its rich, often invigorating aroma, accompanied by an effortless smoke and smooth taste. 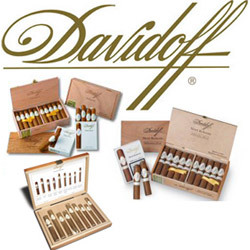 Davidoff cigars and the adjective (always) have become synonymous when they are described. Handmade in the Dominican Republic – Always; Tobaccos are grown in the richest soils with the most ideal conditions – Always; Those very tobaccos are aged for four years and always cultivated as they were five generations ago – Always; A great choice and favorite of thousands already and thousands to come – Always. Bring that certain luxury to your experience, choose Davidoff Cigars.